Which NBC TV shows will be cancelled or renewed for the 2011-12 season? NBC continues to struggle and has found just a little help from its new crop of shows. The Office is still the best-rated series on the network but it remains to be seen if it can survive next year without Steve Carell. Though many were outraged by Outsourced, it’s become the brightest new star on the peacock network’s schedule. Law & Order: Los Angeles had some rough weeks on the schedule. If it can sustain a 2.2 rating, it seems likely to be safe for a second season. The Event has gone on hiatus for three months. The ratings essentially dropped every week and 90 days off the schedule isn’t likely to help. Parenthood’s been dropping as well and won’t be back until January. The episode order for struggling Chase has been reduced and the network plans to switch nights in 2011 — opposite American Idol. Does it sound like NBC’s already given up? The Sing-Off has become a pleasant surprise for NBC. The ratings weren’t very good last season but they brought it back for another round anyway. It’s now the second highest rated show on the network. It’ll certainly be back for another season but will NBC try to run it more than once a year and end up killing the “golden goose”? Below is a list of the regular NBC TV shows and their 2010-11 season average ratings to date. It only incorporates the ratings for original episodes that have aired this season, not repeats. The data is sorted by the 18-49 demographic averages, the group that advertisers will pay the most to reach and, therefore, the audience most important to the network. * Nielsen doesn’t release the final Friday and Saturday night ratings until a few days later. These ratings may change slightly once the final numbers are released. Outsourced should never have been put on the air. Given that the real unemployment rate in the U.S. is near 20%, the concept of this show is incredibly offensive. We’re supposed to laugh about losing our jobs? Cancel it. What I am wondering is why is this show I just found on NBC, Perfect Couples, not on the radar here at TV Series Finale? Last nights episode was supposedly the ninth episode, but I had never heard about it, and just accidentally stumbled upon it. @Craig: That was just a preview and the only one that’s aired. Perfect Couples show starts airing regularly on 1/20. The show I see going cancelled is Parenthood. 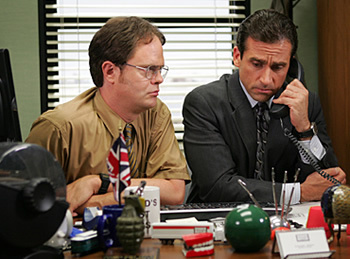 I still do not get the popularity of the American version of The Office. It’s just so awful to me. Also can’t believe the ratings on Outsourced. Find it funny that Walking Dead with 5million viewers is a “runaway smash hit” while the wonderful Chuck with 5.44 million barely clings to life. The ratings system REALLY needs a modern overhaul.